Food Trucks | Where in the World Are Our Kids? Inspired by a few of our favorite things, today Ken and I had a perfect day to celebrate of our 15th anniversary and the payment of our referral fees. The past few years, Ken and I have celebrated our anniversary at Old Hickory Steakhouse, or by buying a NHL Center Ice cable package. This year, we celebrated by taking a day off together to do some of our favorite (or favourite) things. We had a couple of other stops to make before we headed to Food Truck Fridays at the YWCA on Woodmont Boulevard. We both tried a new food truck: Mere Bulles. I tried the crab cake sliders and mac and cheese bites, while Ken opted for a mac and cheese burger and sweet potato fries. The food was phenomenal! And I got a slice of pie from Just Like Nannie Fixed It, and Ken got a plum ice from Izzie’s Ice. Picnic tables were set up on the lawn of the YWCA to enjoy the gorgeous weather for the day. With a high of 73 sunny degrees, it was a perfect day to enjoy the outdoors. We then headed to Centennial Park, where we sat on the steps and people-watched, and sketched to our heart’s content. We were particularly fascinated with a man who was sprinting back and forth in front of the steps. On purpose. Curious. We then turned packed up the car and headed to the Nashville Public Library’s downtown branch. Ken signed up for a library card, and we enjoyed their beautiful facility. There is a cafe in the library that was featured on the Food Network, and we decided to stop for a late afternoon snack special: a latte and piece of cake for $4 total. I got the pumpkin cheesecake, and Ken got a chocolate raspberry cake. Both were amazing! We then walked through the gallery on the second floor, which featured mixed media portraits of the mug shots of the Freedom Riders, who heroically sought to desegregate transportation in the South. The paintings often contained newspaper articles about their arrests, JFK’s response, and their struggles to promote equality among all races. The story is amazing. The library also features a beautiful courtyard with a fountain, and large study rooms. We were genuinely amazed at all the features of the downtown library — and they even validate parking! We picked up some groceries before heading home to watch this week’s episode of Survivor. It was one of the best kickoff episodes of a season, ever. We loved it! Finally, we finished out the evening by making our version of our favorite meal at Old Hickory Steakhouse. We had grilled steaks (which had been marked down for immediate sale at Kroger this afternoon! ), applewood smoked blue cheese mashed potatoes, and mascarpone creamed spinach. I must say that we did a pretty good job mimicking our favorite dishes! But by far, the best part of today was getting to spend some uninterrupted time with each other. We will definitely always treasure our perfect day! Ken came and snatched me from work today to take me to a joyous event: Food Truck Tuesdays at Second Harvest Food Bank. Grilled Cheeserie, Riff’s, Mas Tacos, Happy Eating, and Maggie Moos were all gathered in one spot to raise money for Second Harvest Food Bank. Second Harvest opens up their dining room for a nice cool dining space while enjoying some great food truck fare. September is Hunger Action month. One in six Americans struggle with hunger, and this is the month to go through your extras in your pantries and stock the food banks in your church and community with anything you can spare. Your donation could help a family know where their next meal is coming from. For more ideas on how you can get involved in Hunger Action Month, check out Second Harvest Food Bank’s 30 Ways in 30 Days! Okay, okay. This recipe wasn’t actually inspired by a food truck, but by another trendy taco restaurant in Edgehill, our favorite Kabob restaurant, and by the produce that our neighbors brought us! A fusion of Middle Eastern and Mexican cuisine make this recipe a definite winner. We had it twice in one week! Marinade chicken breasts in the above for one hour. (Meanwhile, put together salad.) Grill or bake marinated chicken until done. Cut into bite-sized pieces. Chop cucumbers, tomatoes, and pepper into 1/2 inch cubes. Dice red onion into 1/4 inch pieces. Toss with cilantro, feta, corn and lemon juice. Salt and pepper to taste. Refrigerate while cooking chicken. Layer taco shells with hummus, chicken, and salad. Delicious, and surprisingly low-fat for how GREAT it tastes! The cilantro and feta are very flavorful, and complement the produce nicely. The hummus is the smooth texture that holds it all together. This has become our new favorite! **I borrowed the idea for this week’s foodtruckalike meal when I saw the ingredients and immediately started salivating. I love the combination of sweet and savory, especially when a grill is involved. And just about anything topped with melted cheese has to be a winner. Here are the ingredients that I used for a . . .
Fry or oven bake the bacon until cooked but soft. Drain on paper towels. Meanwhile, cut peaches in half, remove pit, and grill flesh side down approximately 7 minutes, flip, then grill skin side down another 7 minutes until peaches are soft and carmelized. Remove from grill and slice into 1/3 inch slices. Brush bread with honey. Layer one side of the sandwich with bacon, then peaches. Layer the other side of bread with peaches, then slices of brie. Bake in oven at 375 for 5-10 minutes, or until cheese begins to melt. Finish with 1-2 minutes under broiler to make cheese bubbly. Stack halves together. Eat in silence with a napkin and a heart of thankfulness for the goodness of God and this sandwich! **While saving for adoption, we’re bringing our love of food trucks home, and making our versions of our food truck favorites! Inspired by some of our recent food truck adventures, but short on cash, I’ve been attempting to replicate some of our favorite food truck dishes while adding my own twist. I’ve not been entirely successful in the past, but tonight’s Jamaican Tacos were a huge hit, if I do say so myself (which I may since I am 1/2 of the total number of people who ate them). The main components are: Honey coconut curried rice, jerk-spiced chicken, tortillas, and spicy slaw. Bring first 4 ingredients to a low boil, add 1 C rice. Cover and simmer until all liquid is absorbed. Bake in crockpot on low for 4 hours until done. Shred. If you think I’m the sort of person who makes her own tortillas, you would be wrong! Pile tortillas with rice, chicken, and slaw. The sweet warmth of the rice contrasts nicely with the spicey crunchy slaw. The cilantro cools fire of the jalapeno and onion. Yummilicious. We’ll definitely be making this one again! 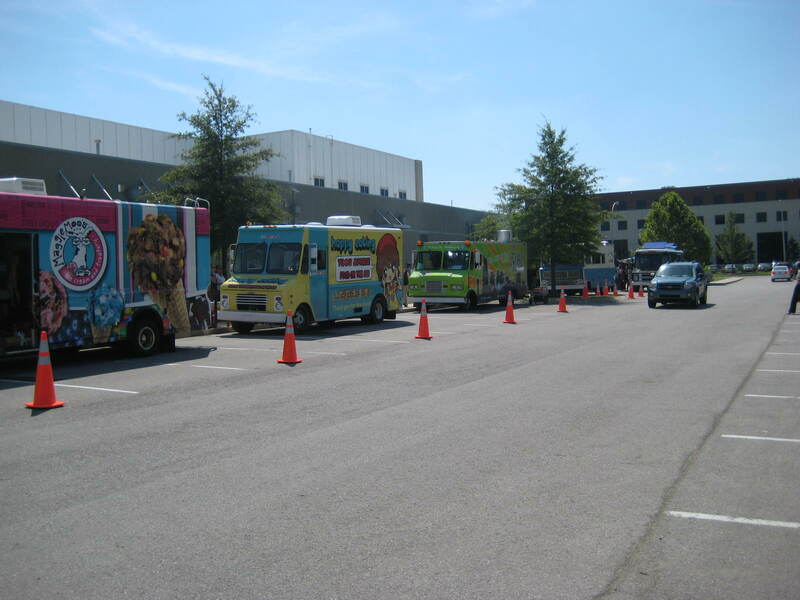 One of the adventurous parts of food truck eating is that it is remarkably difficult to FIND the food trucks! But we love the fact that we can get gourmet food on a fast-food budget, even if we have to eat it at a picnic table or in the car. The trucks are a moving target, literally. We follow blogs and Twitter to try to track them down, but their posting is sporadic and often last-minute. It seems like we’re the storm chasers of this Nashville culinary subculture — always waiting for the perfect storm of foodtruckery. We GPSed our way down to the Urban Flea Market, we spotted Riff’s food truck, but we immediately realized that there was a parking problem. We had to circle around, dodge cars coming down now one-lane streets due to traffic overload before we finally found a place to pull onto the grass on the side of the road. We made our way through the Urban Flea Market: vintage clothes, handmade jewelry, someone playing guitar. Yeah, yeah, yeah, blah, blah, blah. Show me the food truck. We finally ducked under a tree and stepped up to the parking area where Riffs was parked. Or HAD been parked. In the ten minutes it had taken us to find a parking space, Riffs had packed up and left. WITH the stuffed French toast! We stood there dazed and confused, wondering where to turn to next. Lacking Divine inspiration, Twitter was our answer. Mas Tacos Por Favor had just posted their lunch menu. We Googled their location. Even though they started out as a food truck, they now have a brick-and-mortar in East Nashville. Perfect. We once again GPSed our way over to McFerrin Avenue, but the address we had seemed to be wrong. We only saw a barber shop, and a deli. Wait. There was a chalkboard on the sidewalk with “Mas Tacos” and an arrow. We were headed in the right direction. Sure enough, the place that we had designated as the deli (because of the giant DELI sign on the roof) was indeed Mas Tacos. Bars on the windows. Cars crammed in the parking lot. A paper bag with hours scrawled in pen hung next to the door. We couldn’t see inside. We entered the restaurant, not knowing for sure if we were going to be encountering a restaurant or a crime scene. The interior looked like a little of both. It was clearly a clandestine culinary operation. No frills. No ambience. Only 82 degrees and packed with customers in food-stuffing silence, even though it was 11:30 on a Saturday morning, which is typically much too early for tastebuds to be awakened by tacos. This food must be REALLY good. We stumbled through our order, like all good rookies do. We were thankful that we didn’t hear an exclamation of “No tacos for you!” as we attempted to order a combination of classics and specials. Ken ordered the breakfast taco and pulled pork taco. I went with the fish taco and the carne molida. To drink was a watermelon aqua fresca for me, and horchata (cinnamon almond milk) for Ken. We made our way to the last available table with our drinks while we waited for food. My drink was like drinking pure watermelon: delicious. I realize now that in the past I’ve only had drinks that are watermelon-flavored, which are okay, but this was actual watermelon in my drink! Yummy. I didn’t try Ken’s almond milk because I wanted to live (and have an anaphylactic allergy to almonds), but he agreed that it was cool and delicious too. When our food arrived, we decided to proceed to a more oxygen-rich environment where we could keep an eye on our car: outside on the patio. Our tacos were indeed delicious, though a bit on the spicy side. I love spicy heat, but only if the heat compliments the flavor, rather than overpowering it. Still, the meat was tender and delicious, the slaw fresh and crispy, and the double-layered corn tortillas provided a thoughtful way to keep me from dumping the ingredients in my lap. We were very thankful for our drinks. All-in-all, the tacos were very good — not necessarily life-changing, but good. We’ll definitely remember the experience, and if we happen to be in the neighborhood of their brick-and-mortar, or their food truck, we’ll find it hard to pass up. After all, that’s what Food Truck Chasers do! Saturday night, we gathered with some of the college students/young adults in Public Square Park for Mayor Karl Dean’s “Walk 100 Miles” campaign to support making Nashville a better place to live. Jo Dee Messina and Melinda Doolittle were there in concert, and there were more than a dozen activities and booths to visit. But let’s face it, we were there for the food trucks. Ken and I discovered Riff’s food truck last week, and have been Twitter-stalking them since. We found out that they were going to be at this 100 mile event. Bangin’ Tacos was there along with some-other-food-truck-that-serves-wraps-but-we-didn’t-eat-at-so-I-didn’t-get-their-name. Izzie’s Ice provided a nice dessert to cool off at the end of a warm evening. By far, the best part of the night was getting to hang out with friends!